← A preview of my next book! Second excerpt from my next book! If you missed the first chapter, you can find it here. Trigger warning: There is a very small amount of non-consensual touch in the last scene of this excerpt. Beyond this there will be no scenes depicting sexual violence in the book. Darcy could find no particular fault with Netherfield Park. The house was spacious and pleasant. The grounds were well kept. The rolling hills surrounding it kept the landscape interesting. Bingley was a gracious host. His cook produced tasty meals. And after two days, it was slowly driving Darcy mad. He had spent hours calming Georgiana’s anxieties about being in a new place. He had walked with her around the gardens and listened to her practice her music. The previous night he had stayed up late drinking brandy with Bingley, something he had been looking forward to. But instead of finally being able to talk freely to his friend as he had hoped, he had hidden everything. Today Bingley had gone to visit a neighbor, and Darcy was too restless to keep his attention on a book. The only distraction he could find was to work on his billiard game. At least it was quiet in the billiard room apart from the clicking of balls striking and the satisfying thump when one dropped into a pocket. “I suppose we must, then,” said Darcy grudgingly. Had he not already given up enough for his fellow countrymen? But the same answer always resounded in his head. Many had been forced to give their lives for their country, and he had not. Yet. He would only go to this damned dance because if he refused and anything happened to those poor girls, he would bear that burden forever. Along with so many others. Sometimes he wondered if a clean death in battle would not have been preferable. But Georgiana needed him, so that was not an option. Bingley clapped him on the shoulder. “No need to be so glum, old fellow! You might even enjoy yourself a bit. From what I gather, you are getting the young and pretty one. Mine, according to her loving father, is all but on the shelf and ‘not what I would call pretty, but a good girl, a good girl.’” His voice had deepened into an imitation of an older man’s. A quarter of an hour later, the stable master regarded Darcy as if he were a being from another planet. The Netherfield staff had not yet accustomed themselves to their guest’s eccentricities, such as saddling and bridling Hurricane himself. But Hurricane was the one luxury he had insisted on keeping at a time when he had given up so much else. He had raised and broken the horse himself, and Hurricane always understood him. Darcy hated allowing anyone else to handle him. Even the process of saddling him and the feeling of Hurricane’s warm flanks under his hands brought him peace. They set off at a trot down the lane and jumped a fence before cantering across a field. The sun had not yet burned off the dampness in the spring air. These thoughts were not helping to clear his head. He laid a hand on Hurricane’s neck, feeling the tautness of his muscles beneath his shiny coat. Hurricane was still with him, loyal, steady Hurricane. At Pemberley he could gallop for miles over the empty moors, but Hertfordshire was more settled. He spotted a copse in the distance and made for that, hoping to find some semblance of untamed nature there. He skirted the edge until finding a path leading into it, but before he even entered the copse, a familiar floral scent transported him into the past. It was a bluebell wood. On impulse he dismounted and tied Hurricane’s reins to a tree. Yes, before him bluebells swayed in the dappled sunlight. He strode towards them as their almost otherworldly scent enveloped him, raising goose bumps on his skin. The spring green of the wood was the perfect frame for the sapphire flowers. Magic, his mother had called the bluebells. His pace slowed. 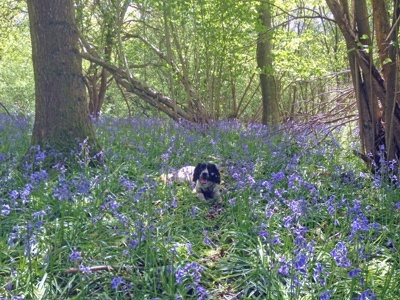 How long has it been since he had visited a bluebell wood? He could not even recall. The bluebells seemed to dance around him with a ripple of laughter. But no – that was human laughter, and it was followed by a squeal of pain. “That hurt, young man! Or young woman, as the case might be.” A woman’s musical voice seemed part of the magic, drawing him towards it with a seductive enchantment of its own. Where was she, the woman of the rippling laughter? He searched for a side path through the flowers. His mother had taught him never to trample bluebells. His lips curved. A poet would call her Titania, queen of the fairies, in the flesh. More woodland magic! “Yes. I am visiting from Derbyshire. Or, if you prefer, I will say it – ‘Theophilus Thistle, the thistle sifter, sifted a sieve full of unsifted thistles, thrusting three thousand thistles through the thick of his thumb.’” It was the tongue twister no Frenchman could pronounce, no matter how accent free his English might be. “Because I was walking through an enchanted bluebell wood when I heard the dulcet tones of Titania, queen of the fairies, which enspells any mortal man.” He swept her a full-court bow. “Of course. You could have been a French soldier out hunting for game.” The distaste in her voice made it clear what kind of game the soldiers hunted here. “Good. I trained my sister to shoot for the same reason.” One of the puppies began to crawl in his direction. At her nod, he picked up the puppy. The mother dog raised her head and growled. “I will keep that in mind.” He turned the puppy over in his hands and examined him. “If you were still wondering, he is a young man. Definitely a young man.” He held the puppy up to his shoulder and scratched its ears. Pushing back against his hand, the puppy reached up to lick his chin. Repeatedly. She set down the pistol at last, picked up the puppy, and waved a tiny paw at him. “Theophilus Thistle, I grant you safe passage through my domain.” She crinkled her nose at him. 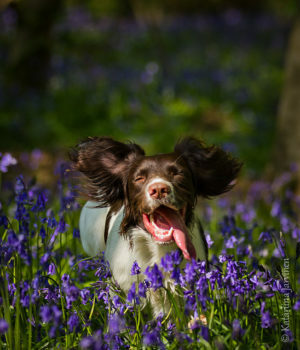 As he made his way back through the sea of bluebells, it felt like the first time in years he had truly smiled. 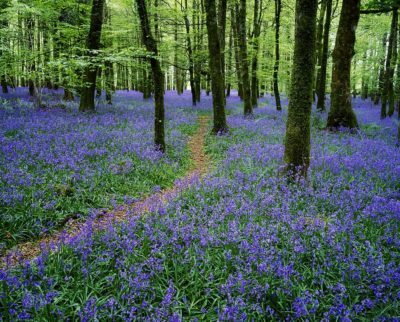 His mother had been right; there was magic in a bluebell wood. He would not wait so long to revisit one. Perhaps he would bring Georgiana here. She was even more in need of a dose of magic than he was. Darcy’s improved spirits lasted through the following day, even when it came time to depart for the assembly. He had resigned himself to the prospect of spending the evening with a silly, chattering girl. After all, he did not have to listen to what she was saying, did he? Miss Lucas, whom they collected first, was a pleasant surprise, or at least a relief. While living up to her father’s description, she was soft-spoken and seemed sensible, and more importantly showed no embarrassing intention of flirting with either Bingley or Darcy. She was a peaceful presence. If he had to spend an evening escorting a woman, someone like Miss Lucas would suit him well. He was less sanguine about the prospect of Miss Elizabeth Bennet. Miss Lucas described her as much younger, with a lively wit and a strong will. Not the sort of comfortable companion he would prefer. Still, he managed to be civil through his introduction to Mr. Bennet and even to ignore that gentleman’s slightly scornful coolness. Then a familiar face appeared, one whose eyebrows shot up in surprise. “Theophilus Thistle!” she exclaimed. Bingley looked more baffled than ever. Mr. Bennet wore a quizzical look. “That as well,” Darcy agreed. No. Not his Titania, too, turning away from him because of his association with the damned French. Why did the one bit of joy he had discovered here have to be quenched by those damned assumptions he could not contradict? His stomach churned. Well, so be it. He had agreed to the sacrifice himself, and he would do it again in the same circumstances. But sometimes it was simply not fair. It was not fair. Elizabeth did not want to like Mr. Darcy. How could she like a man who put his own wealth and possessions before his love of his country? True, he had been far from the only man to do so, but she was prepared to hate every last one of them. But she had liked Theophilus Thistle. How long had it been since she had the opportunity to exchange witticisms with an educated young Englishman? He had displayed a sense of humor and an ability to laugh at himself, and he was unquestionably pleasant to look at. He even liked to cuddle puppies. Why did the best prospect for flirtation she had met since the invasion have to turn out to be a French sympathizer? Oh, if only she could stamp her feet in frustration! She should have realized who he was and not allowed herself to dwell on him. It was not as if young men of wealth and education suddenly appeared from nowhere. But it had been such a pleasant interaction that it had never crossed her mind he could be a traitor to England. And now he was being unfair again, not only engaging her playfully, but then having the gall to look injured when she treated him as coldly as he deserved. Did he think his bloodstained wealth would influence her? If he had to consort with the enemy, the very least he could do was to behave like an unpleasant fellow. Before his arrival, she had been prepared to dislike the unknown Mr. Darcy, and dislike him she would, regardless of whether he cast puppy dog eyes at her. She certainly would not tell him she had named the mischievous puppy Puck in his honor. Fortunately, she had a great deal of practice at being coldly polite. “I am afraid it is already promised.” It was just as well. If she had to spend half an hour close to him right now, he might start seeming like the delightful Theophilus Thistle again. That would be a mistake. Charlotte pretended not to hear her, but judging by Mr. Darcy’s raised eyebrow, he had made out her words as well. “There is no surprise in that,” said Elizabeth. Mr. Darcy, of course, said nothing. The first dance was indeed a waltz, and Elizabeth feared the second might be more of the same. To her relief, the musicians struck up a reel for it. That meant less opportunity for speech with Mr. Darcy, less ability to gaze into each his eyes, and she did not have to spend half an hour with his arms around her. A pity – she had imagined the pleasure of waltzing with Theophilus Thistle, but that had been before she discovered who he truly was. “I see them as men, some good, some bad, and I have yet to meet a single one who wishes to be here. They are following their Emperor’s orders, and they would tell you that we started this war, not them.” He glanced around as if to see if anyone might be listening. With a huff, she turned to watch the dancers. No matter how handsome and amusing Mr. Darcy might be, he was a traitor, pure and simple. At the end of the dance, she gave him only the curtest of thanks before Mr. Bingley came to claim her for the third dance. By the end of that set, she was almost calm again. “It is three years old, as you know well,” said Elizabeth, but she bit her tongue before saying anything further about the source of Lydia’s lovely gown. No matter how much she disapproved of Lydia’s decision, she could not deny it had made her family’s life more comfortable. Not that Lydia cared about anyone’s comfort but her own, of course. “I suppose your parents had no choice but to allow it.” Bingley sounded bitter. “Taking over our country was quite bad enough, but how dare they behave as if it means our women are their playthings!” said Bingley with some heat. “I do, but they have protected themselves, at least to the extent they wish to. They have been very successful in French society circles in London. No, it is more that I hate watching how the French officers swoop in on the nearest pretty girl and treat her as their personal property.” His scorn was strong enough to make Elizabeth wonder if he once had a tendre for one of those pretty girls. Miss Bennet – Darcy was going to have difficulty not thinking of her as Titania – had an odd, stiff expression when captain of the garrison asked her to dance, and she did not move with her usual smoothness when the music began. Something was amiss. Was there going to be trouble? Darcy watched closely, just in case. The trouble started almost immediately. The captain was holding Miss Bennet too closely as they waltzed. She had been light on her feet when she danced with Darcy, but now she looked clumsy. Her face was in shadow, perhaps because she was looking down. The captain was speaking to her at length, but her replies appeared to be no more than a word or two. Then the captain slid his hand downward from her waist to her hip. Judging by the pleased smirk on his face, it was no accident. Darcy’s hands wanted to clench into fists, but he forced them to relax and gritted his teeth instead. No one could see his gritted teeth, but visibly clenched fists could raise suspicions. He could not afford to draw attention to himself by interrupting the dance, but he took a few deliberate strides until he was only a few steps away from the dancers, making it clear he was watching. His mere observing presence seemed to have no effect on the captain’s behavior. Miss Bennet was practically stumbling over her own feet. Damn the man! Darcy would give it another minute or two, but then he would have to intervene, even if it did draw the wrong sort of attention. Then she tripped while turning. With a sharp cry she staggered backwards, favoring her left foot. “How clumsy I am! Pray forgive me, captain; I seem to have twisted my ankle.” She began to hobble toward the seats by the wall. Rage clouded Darcy’s vision. Without stopping to consider his actions, he cut between them and scooped Miss Bennet up in his arms. “That is very kind of you, Captain, but I am sure Miss Bennet would not wish to be any trouble to you.” He carried her towards the entrance to the hall. That was hardly news. Why had he reacted so angrily when the captain attempted to take liberties? Simply stepping in and saying something might have sufficed to stop it, and it would have drawn far less attention to him. Now he might well have made an enemy he could not afford, all because he had not been able to tolerate that man touching a woman Darcy hardly even knew. No, it was not just that. It had been the half hidden look of despair in Miss Bennet’s fine eyes. It made him willing to do anything to rescue her, even if it meant forgetting his other responsibilities which ought to have taken precedence in his mind. Now those fine eyes sparkled with irritation at him. Most likely she did not realize yet the consequences of what he had done. If he was luckier than he deserved, perhaps she never would. “I apologize if I overreacted.” He could say nothing more, not with all those ears listening to his every word. Darcy spoken his most authoritative voice. “Miss Bennet has injured her ankle. I think it best to take her home directly.” Good; from the expression of the nearby officer, his words have been noted. “I suspect there is no need. He is already headed this way.” Of course he was; no one could have missed the little scene Darcy had made. After Darcy made a quick explanation to Bingley, a servant informed him the carriage was outside. This time Darcy let Miss Bennet lean on his arm as she limped to the carriage. He handed her in, followed by Miss Lucas. Their dark heads bent together, the two women were already conversing in low tones when he followed Bingley into the carriage. He rapped his cane on the roof to signal the driver to start up. “What happened?” asked Miss Lucas. “Oh, Lizzy, I am so sorry.” Miss Lucas moved closer to her friend. “We have been hoping he would be transferred away. Unfortunately, it has not happened.” Her voice trembled. “It is not that simple!” Darcy avoided Miss Bennet’s eyes. After brief silence, Miss Bennet spoke in a level, restrained voice. “It seems I owe you more thanks than I knew. But why would a captain in the French army defer to you?” Apparently even in a situation this unpleasant, she was reluctant to be indebted to him. “You must not be acquainted with the people of Derbyshire if you believe that I or any man could convince them not to rebel if they truly wished to.” His voice was sharper than he had intended. “So you favor giving in to our conquerors to avoid risk?” Her voice was sharp. “No. I favor keeping Englishmen from throwing their lives away when there is no chance of victory,” said Darcy. “Lizzy,” said Miss Lucas in a low voice. Miss Bennet shifted back on the bench, took several deep breaths and folded her hands in her lap. “My apologies, Mr. Darcy. We have all found our own ways to live with the French, and it is not my place to criticize the choices others have made. If you have spared me, even temporarily, from an untenable situation, I am grateful.” But it was easy to see her words were recited rather than coming from her heart. “Do not tempt me!” But she smiled as she said it. Miss Lucas, apparently deciding this was as much of a truce as she could hope for, began to discuss the weather in a determined manner. He had plenty of practice at false stories, after all. Once upon a time, disguise of every sort had been his abhorrence. Now he could hardly recall when he had not worn a disguise. Her scent of lavender lingered even after she was gone. Are you puzzled, too? Can you pronounce the full Theophilus Thistle tonguetwister? So, what did you think of Darcy and Elizabeth’s first encounter? Any new theories yet about Darcy is collaborating with the French?? There should be another chapter next week. Thanks for reading! I’m loving this plot twist! I just love your imagination. You always mix romance with angst. It’s the perfect combination! A great new story, Abigail! I just discovered this blog, and I am all anticipation to read the entire story. Your excellent writing style is so delightfully familiar to me ever since the time when I read your very first story on BoI. Thanks, Eli! It’s so nice to see you here. Wow, this is really different. I thought Mr. Darcy’s Journey had a unique twist, but it doesn’t compare to this. I can’t wait to see how it pans out. What inspired the idea of a successful French invasion and occupation? I love the scene in the forest with Darcy, Elizabeth, and the puppies. I’m looking forward to the next excerpt. Thank you for sharing. I too am very interested in where this will go. I very much enjoyed the scene in the woods but was surprised at how playful Darcy was. Usually it takes him awhile to warm up. Also, there is a small grammatical error I’m sure you’ll catch before you’re finished but in case you haven’t yet – I think I liked it better when…and you WERE pointing a pistol at me. I just reread Mr. Darcy’s Journey because I have to read one of your books quite frequently or I go into withdrawals. Thank you for all the great stories and getting the chemistry between Elizabeth and Darcy just right.